New York, NY: Little Simon, c2003. Typ 2070.03.7636. Gift, William H. Bond, 2004. MS Am 2829. Deposit, Julio Santo Domingo III, 2012. Forms part of the Julio Mario Santo Domingo Collection. Spencer Company, no place, no date. 21472.59.35*. Gift of Mrs. Harcourt Amory, 1927. 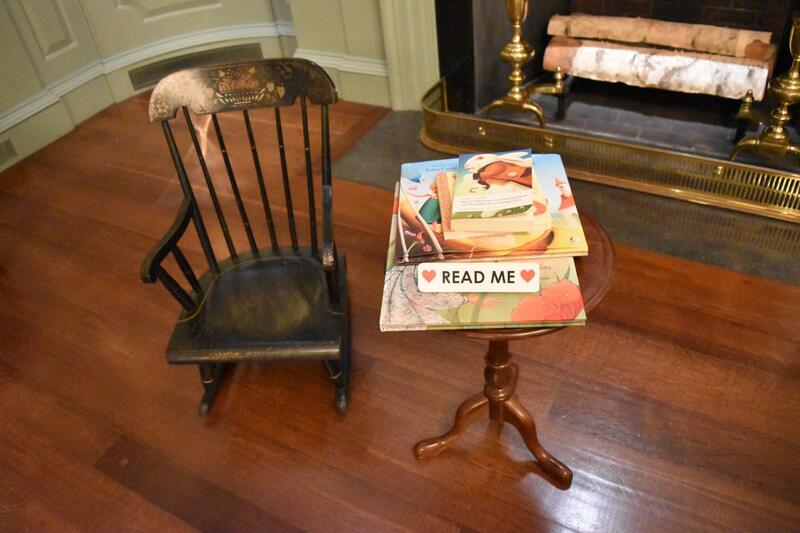 Young visitors can enjoy several editions of Alice in Wonderland in a mini chair. 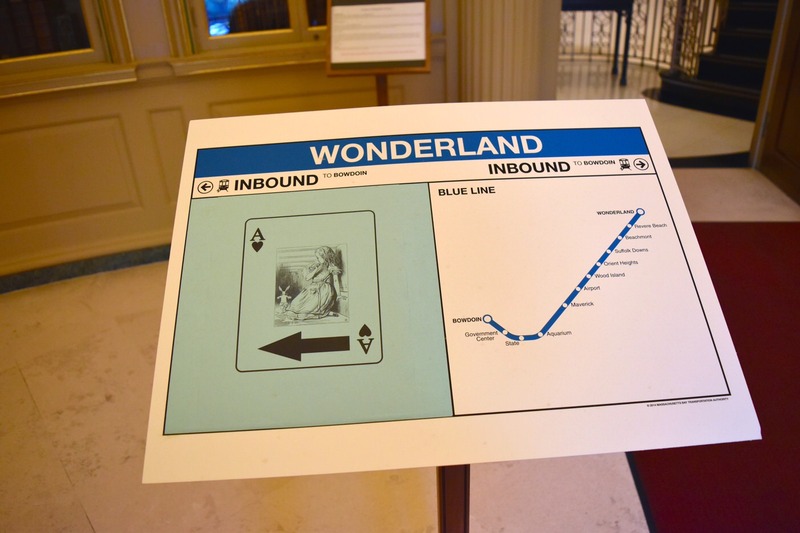 A direction sign outside the exhibition that shows the portion of Boston's subway map with the station "Wonderland." One and a half centuries after Alice first fell down the rabbit hole, she has arrived at one of Cambridge’s most serious places: Houghton Library, Harvard’s primary repository for rare books and manuscripts. In its summer exhibition, Such a Curious Dream! Alice’s Adventures in Wonderland at 150, the library explores the enduring legacy of one of the great masterpieces of children’s literature by putting on display an eclectic collection of Alice-related manuscripts, artworks, and paraphernalia. When British mathematician Charles Dodgson first published Alice’s Adventures in Wonderland in 1865 under the name Lewis Carroll, it was an instant sensation—the Harry Potter of the nineteenth century, as curator Heather Cole put it. In an era when most children’s books were cautionary tales designed to teach lessons, Carroll’s work was groundbreaking, she said, for depicting nonsensical happenings in a fantastical world that deliberately contained no moral messages whatsoever. In the ensuing decades, the book has been republished in more than 300 editions and translated into 40 languages, including Pitman shorthand and Klingon (a constructed language spoken by fictional humanoids in Star Trek). 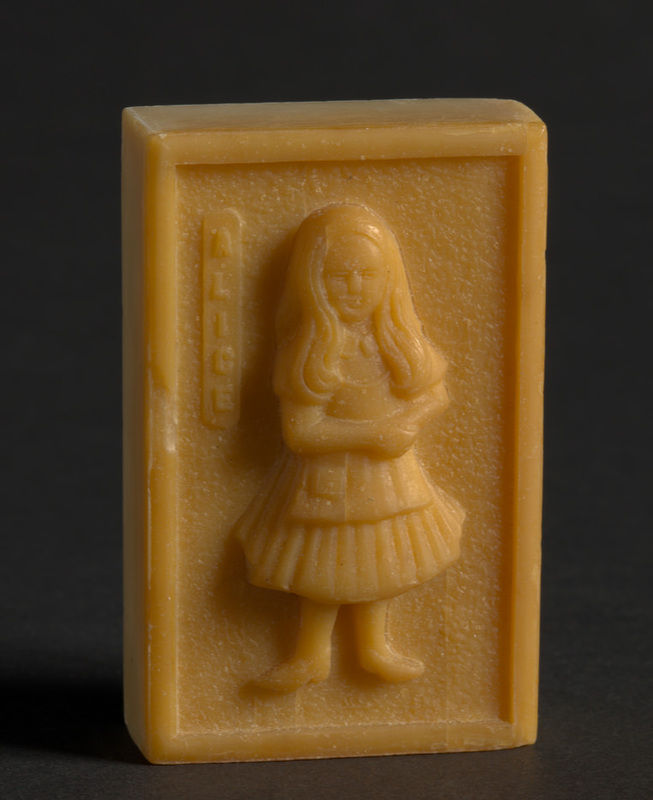 Visitors can get a sense of the multifarious ways Alice references have been used throughout the past 150 years, thanks to objects like an Alice-themed advertisement for Guinness beer, a 1912 political satire of Theodore Roosevelt’s presidential campaign titled Through the Outlooking Glass, several soap bars engraved with characters from the book, and Alice-inspired blotter papers intended to contain hundreds of doses of LSD. 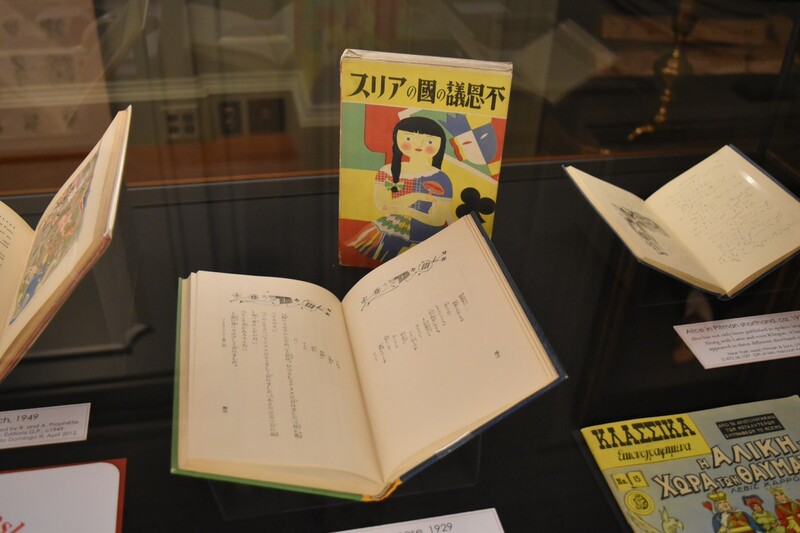 The exhibition is full of pleasant surprises and clever details: all case labels are designed as playing cards, a pile of various editions of Alice lies on a table with the sign “Read Me,” and a paper Cheshire Cat mischievously grins from the curtain of the exhibition room. “But my name isn’t Radcliffe,” said Alice, as she took a seat. 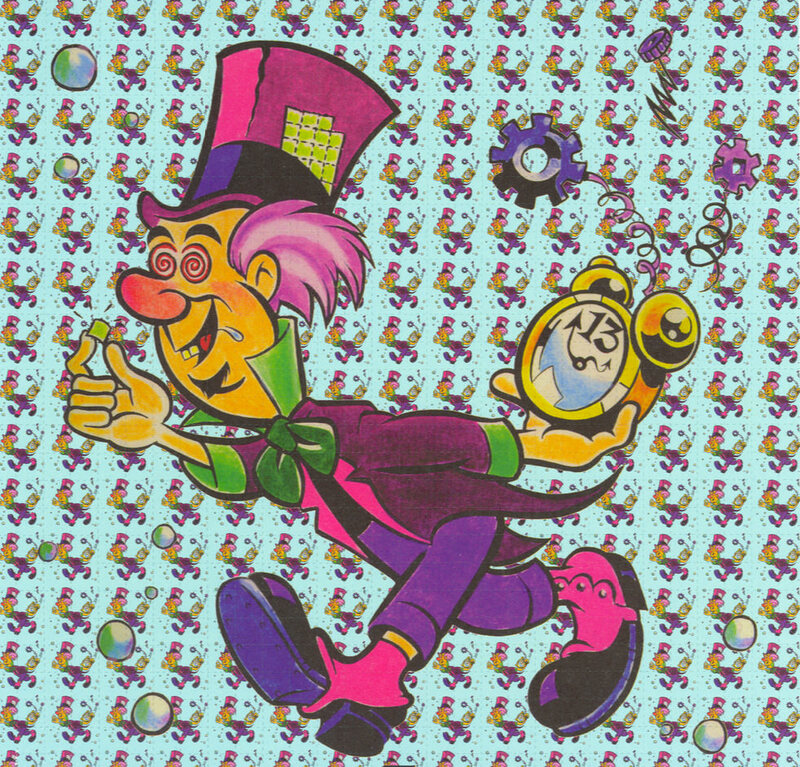 “Nobody said it was,” the Hatter replied. “But you looked at me,” said Alice. 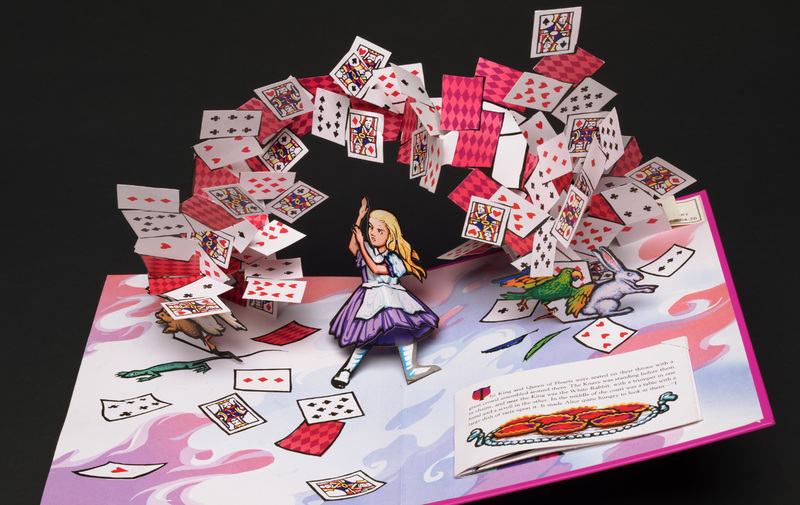 The Houghton exhibition is part of a worldwide celebration of the 150th anniversary of Alice’s publication, with many organizations—like the Morgan Library and the Grolier Club—putting on display their own collections of Alice-related materials. Most of the items in Harvard’s exhibition were collected by Harcourt Amory, class of 1876. Cole, the curator, hopes that the exhibition will attract visitors who otherwise would not step into Houghton Library—a scholarly place with a hushed, strict atmosphere. The exhibition runs until September 5, and is fully digitized.